According to the World Health Organization, age-related macular degeneration (AMD) is of the leading causes of vision loss in the world. AMD is typically asymptomatic in the early stages, which is why eye exams are needed to identify the condition. 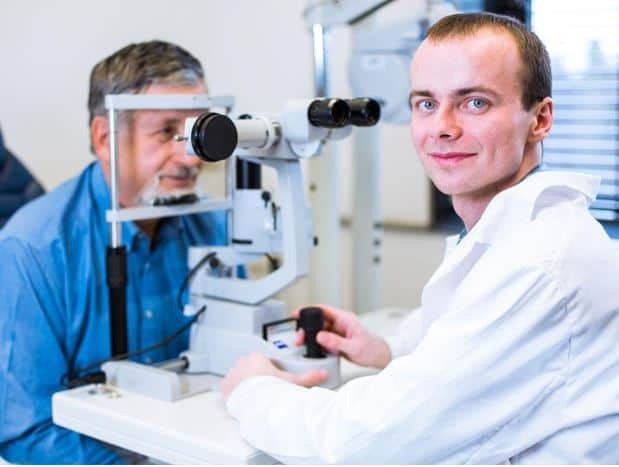 Today, 20/20 Image Eye Centers, your provider of industry-leading eyeglasses and other quality eye care, explains how AMD is detected and treated. AMD can be diagnosed through a comprehensive eye exam. During your exam, we’ll instruct you to stare at an Amsler grid that is made of straight lines and a reference dot in the center. We’ll ask if you see any dark areas or wavy or distorted lines in the grid. Upon finding signs of AMD, we may also dilate your eyes and examine your retina and macula for any changes or irregularities. Although there is currently no cure for AMD, your eye doctor may recommend various treatments to slow the progression of the disease and preserve your vision. For those with dry AMD, we suggest eating foods that are substantial in eye-friendly nutrients. Spinach, kale and other dark, leafy greens, for example, are rich in antioxidants, particularly lutein and zeaxanthin. They fight off free radicals in your eyes, maintaining their structural integrity. Including citrus fruits in your daily intake is also a good idea since they are good sources of vitamin C, which can help strengthen your immune system. We may prescribe supplements as well to increase vitamin E and zinc levels in your body. For individuals diagnosed with wet AMD, anti-vascular endothelial growth factor (VEGF) treatment may be effective. This medication prevents fragile blood vessels from growing, reducing fluid leaks to your macula and retina. Laser surgery is another option. This involves directing a laser light beam on the abnormal blood vessels. It can help reduce the number of blood vessels and seal off any leaks. Most importantly, you should visit your eye doctor regularly. As AMD is asymptomatic at first and prompt treatment is so critical, having regular eye exams is a must. The sooner we identify this condition, the better chances we have of halting its progression and saving your vision. Complete our form and schedule an appointment today. We serve various AZ communities, including Scottsdale, Tempe and Mesa. Feel free to check out the first part of this special blog to learn more about the causes of AMD.